On the last day of the hunt we decided to make a huge push to the highest point that would allow us to see the most country. 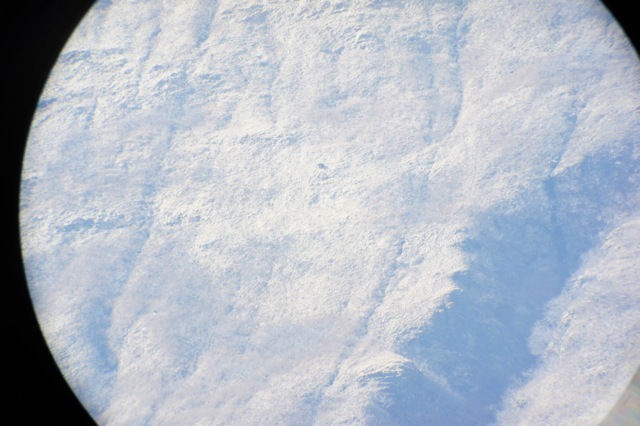 As we neared snow line we came face to face with a great big boar and sow mating (literally) on a snow drift. With 4 hours to go, Lance passed up the big boar, resigning to go home empty handed rather than settle for less than his dream bear. Then it happened. 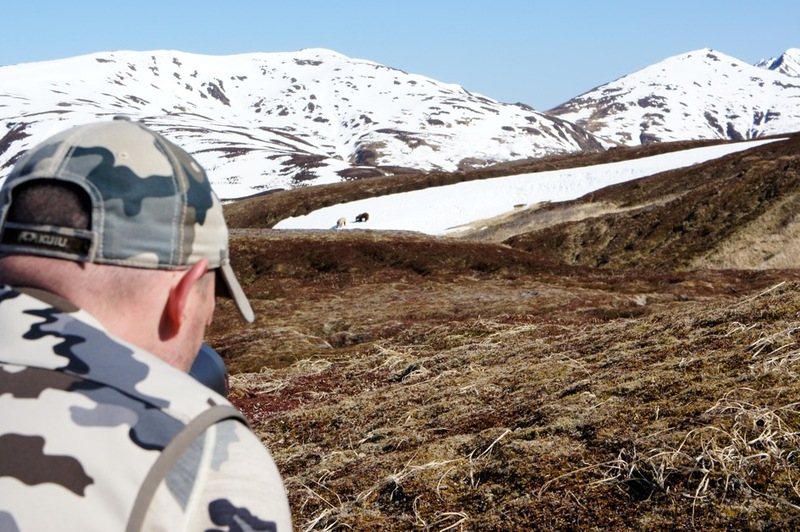 While joking around about the only thing missing on this great hunt was a field photo with a Volkswagen sized bear, Lance spotted a big dark spot coming out of a deep cut in a far off hillside. Not only was it a bear, it appeared to be the big boar we had searched for all week. With no time to spare and one favorable glimpse we took off on what would be the last chance to fill the tag. The bear still 3-4 miles away with 2 hours to go. 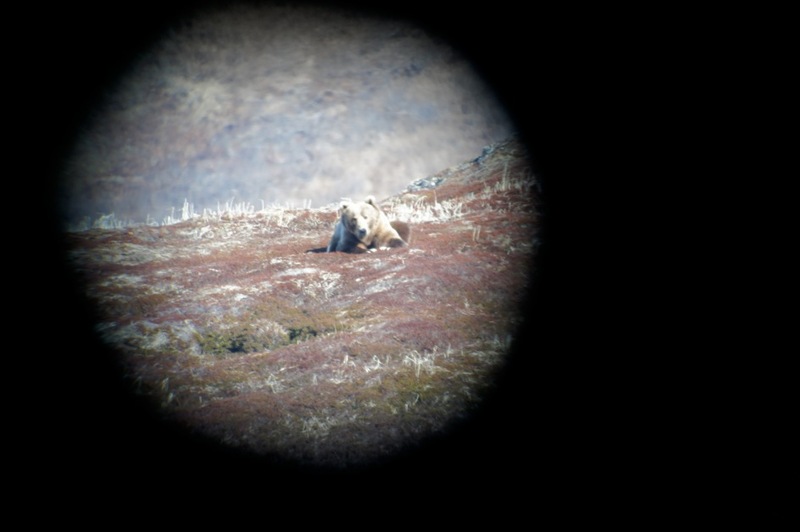 At just over a mile away Lance set up the scope to get a final judge on the bear. He literally looked through the spotter for less than 5 seconds and said “ that’s him, I don’t need to see any more”. 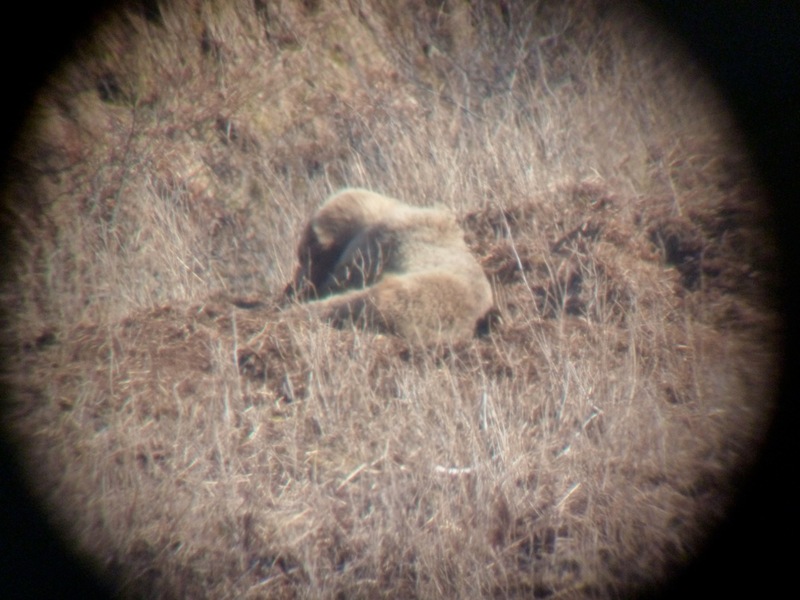 I took a glimpse through the scope and finally understood exactly what Lance had been describing all week- An articulated buffalo with popeye foreams, a Jurassic park dinosaur neck, and a muzzle as big as a coffee can. Luck finally worked in our favor and the bear slowly began to move our way. We closed the mile gap quickly and met him the middle of a giant grass flat at the base of the mountain. With the sun down and less than an hour to go, Lance pushed the safety off of what has to be the ugliest 338 in Alaska. At 175 yards the bear turned and offered a broadside shot. The first shot connected. It would take 6 more before he stopped moving. As we walked up on the bear and confirmed he was dead, Lance walked all around him to see what he had. A huge smile broke over his face and I could tell this was a bear worthy of the effort. I am rarely speechless, but this bears size was shocking. Although it looks big in the Photos they cannot translate the body mass on this thing. Picture a draft horse crossed with a chain saw. After the mandatory Sat phone calls home to let everyone know of our good fortune, and a photo session to preserve the moment, we set about skinning the bear. Six miles from camp and with the plane scheduled to pic us up at 9:30 am, it was going to be a long night. We arrived back at camp at 4 am just in time to start packing up for our extraction. With 15 minutes to spare we had everything sitting on the beach as the blue and white beaver arrived. 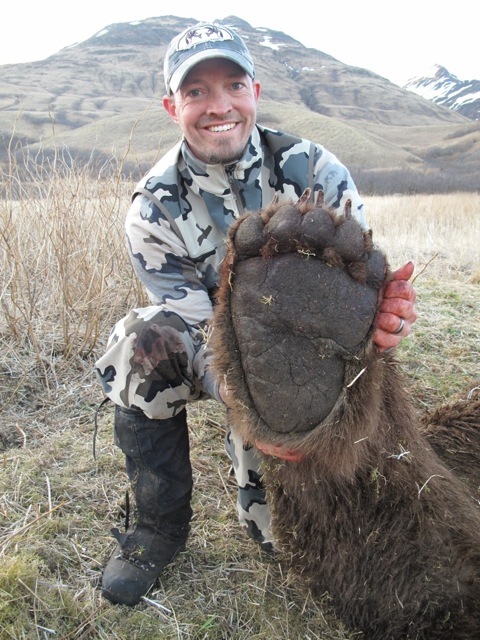 Lances big Kodiak bear squared 10 foot 1 inch and was estimated at 18-22 years old. Definitely worth the wait! What an amazing animal and hunt. That photo of the paw is shocking! Fantastic bear, guys!! Once in a while you are rewarded for holding out for what you truly want.. when’s my turn? Oh my goodness!! Chills were sent down my spine when you said it took 7 rounds to kill it. Then saw the picture and understood why. Nice bear and congrats! 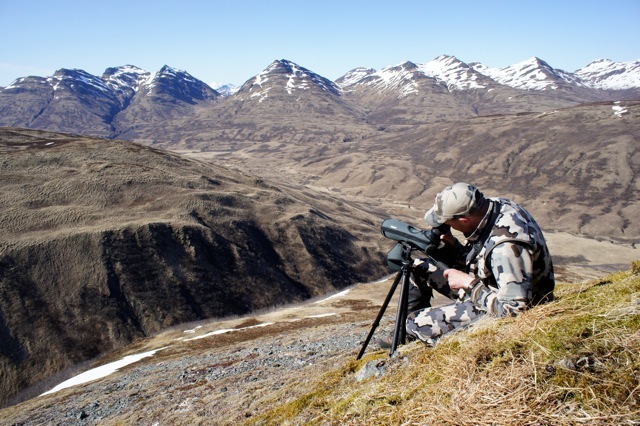 That is my dream hunt and I hope to have you guide me at some point in my life! Holy Smokes! What a hog! Nice bear and a great story pics and to go with it. If it had tusks and a trunk it’d be a friggen mastadon. That thing is a beast, no wonder it swallowed up six from a .338. WOW!!! What an AMAZING animal! Thanks, B.B. for sharing the story, and all the fantastic photo’s. 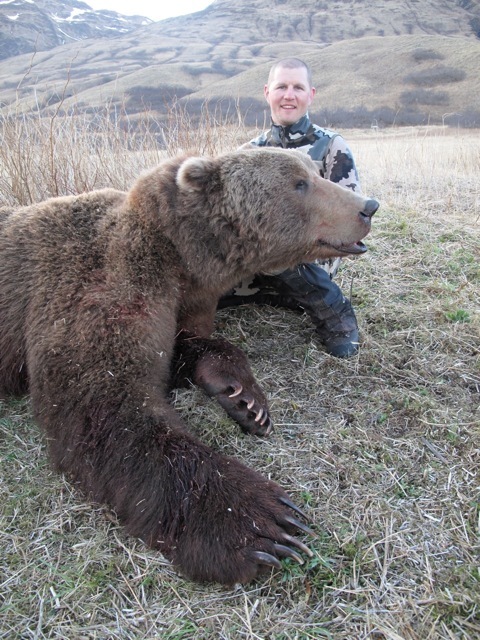 Congrat’s Lance- I hope that ‘Basement Trophy Room’, I read about in another story in ‘The Hunt’, has an access point to allow you to get that bear in there… Which I would assume, will be a (life size) mount!!! If I ever have the opportunity to hunt those giants in the future, you are FIRST on the list to contact. Yeah, Lance’s taxi might hav to work on-site to do this one! Truly amazing how big that bear is. It could swallow a black bear whole. Truly amazing beast and adventure!!! Great story and wonderful bear! How’d the gear hold up? Great job guys! There was never any doubt. Lance you deserve it, so set back and enjoy it for a couple days. Its great to see you shared the experience with Brendan. Memories to last a lifetime……I’m Jealous. Can’t wait to hear the story first hand. Amazing bear! That paw is huge…. Thanks for all the pictures. 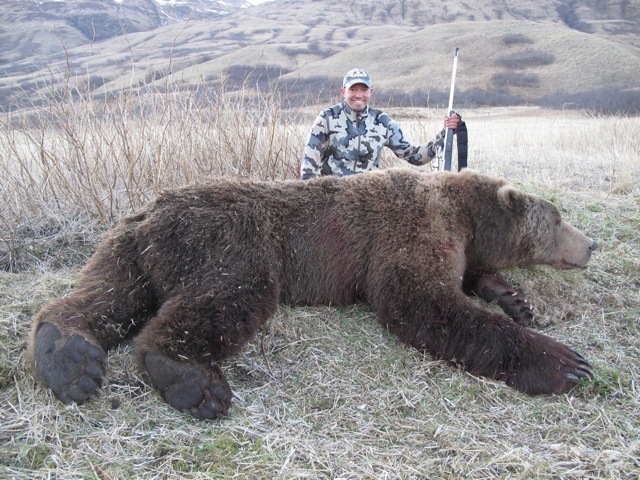 Great Bear -I have hunted Kodiak many times, what a special place. The Emerald Island. Congratulations on a true trophy. That bear is an absolute giant. Great story and pictures. 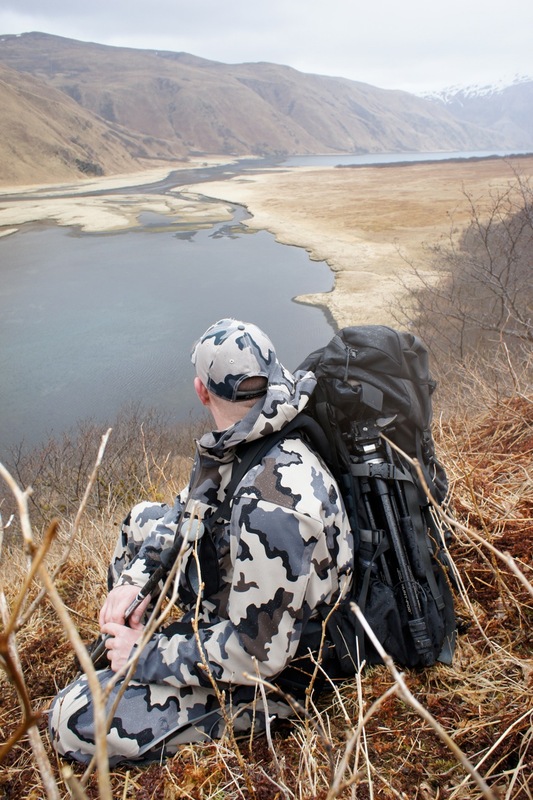 Great bear and a really wild place to hunt them, but I am surprised that no one mentioned that it occured on Kodiak National Wildlife Refuge where bear management is first and formost. The Refuge occupies 3/4 of Kodiak Island and is one of the good things our government does for the environment and the citizens. Great hunt, great recap and photos–it is always a pleasure to see guys really getting after it in such a wild place. That is truly a monster bear. I was curious, how big was the skull? It is always interesting to compare squared size and skull size, and that thing looks like a giant. Also, what is your guess on hide weight packing out? 200 lbs? Thanks again for the story, and a great bear–congrats! Great story and an awesome bear. Looks like you guys had a great trip. I think you should have got some tight, full frame, live head shots of him before Lance let the air out-of-him . . . 😉 . . . congratulations an the hunt and it looks like the new camera worked like a charm . . .
Holy $&!% balls and bricks thats a mammoth bear! Congrats! Probably much deserved. Thanks for commenting guys. I have been traveling so excuse my late response. It was an awesome trip and the giant bear was icing on the cake. 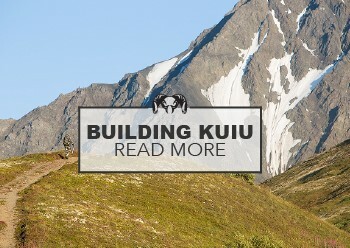 The KUIU system worked great, I was dry and comfortable from bell to bell. Cant ask for more in those conditions. Lance is having the bear life sized which should be a nice addition to his other mounts. The Skull size on the bear is 27 inches. It has a really wide skull but short length. Boone and Crockett is 26 awards book and 28 all time. It had one of the largest back pads Lance had ever measured. We knew it was going to be an all-nighter so we took our time and skinned the bear really clean( ready to salt) on the spot including pulling the paws and turning the head. I weighed the hide in Kodiak at 99 lbs. It seemed heavier. Tony-I will take that as a compliment coming from you! Camera worked great. Thanks for the story and pictures. What a giant! 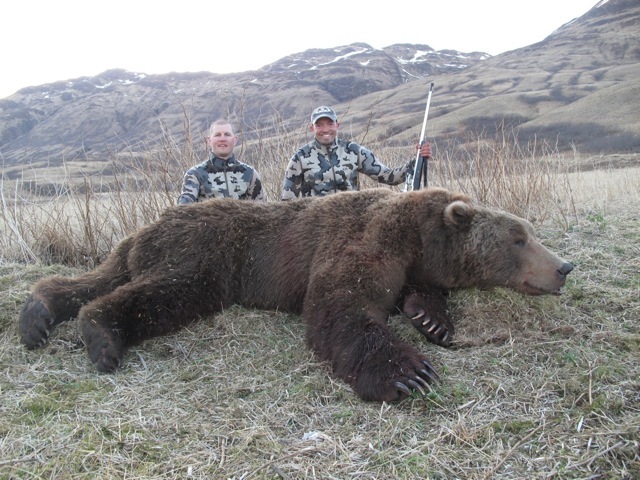 Would like to see other pictures like skinning the bear, packing it out, camp pictures, gear pictures, airplane that transported everything, and any other pictures to give us more visual participation in the hunt. Great hunt! 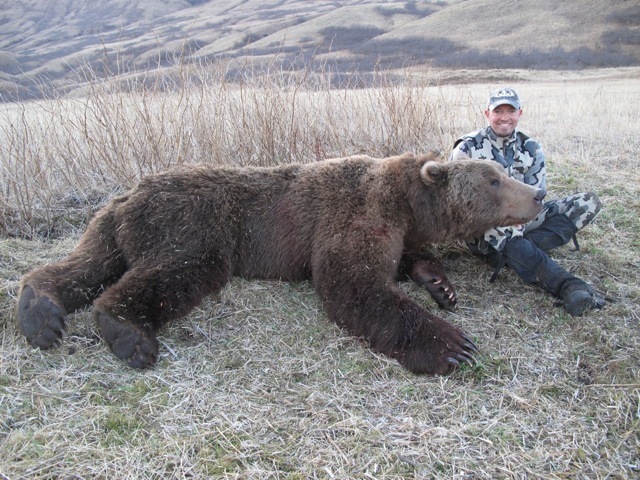 Congratulations Lance and Brendan, thats is a absolute tank of a bear! Finding that bear took some real effort. Score for perserverence; 100%. There is no mention of packing out meat. Did you pack it out? Being from Maine, we hunt black bear and eat the whole thing. 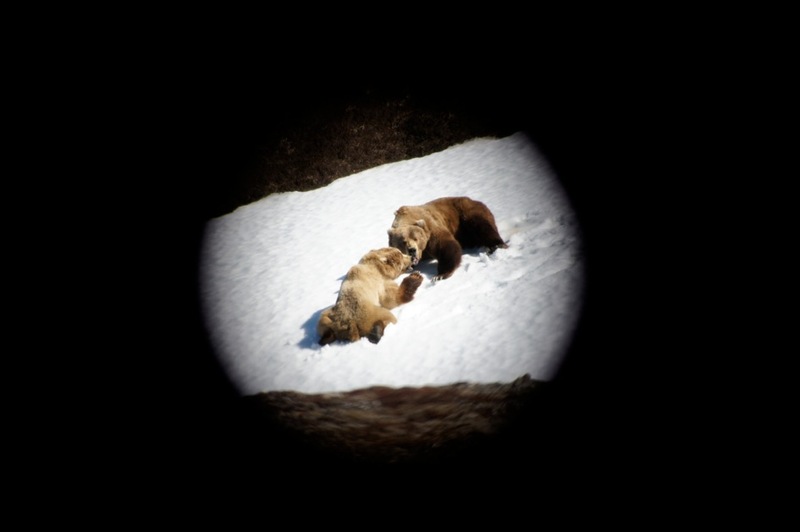 I once had a chance to go spot and stalk griz hunting with Don Thomas in AK, but turned it down when he mentioned that the meat was unpalatable while the bears were into the salmon runs. Is that the case with this bear? What was he eating? Another guide from BC told me the griz meat is delicious if you take one off a blueberry field. That’s the hunt I’d go on. Personally, I could not pull the trigger on an animal I did not intend to eat and my non-hunting (not anti-hunting) friends tell me killing animals for horns and fur, not meat, is the only kind of hunting they are opposed to. I like Steve Rinella’s approach. Kill it, butcher it, cook it and eat it. Show the public that side of hunting or just don’t kill.